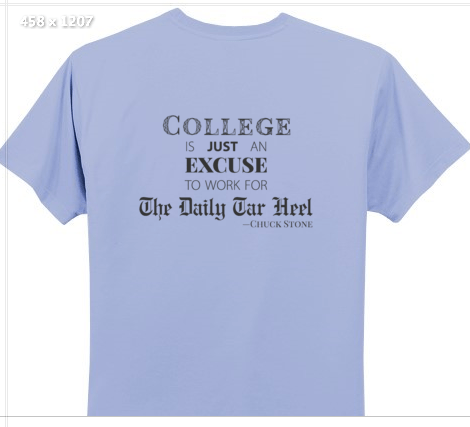 If you worked at the DTH in the 1990s and early 2000s, you knew Professor Chuck Stone. He taught censorship and magazine writing, but what he really did was inspire us all with his stories as a pioneering black reporter and columnist. In Philadelphia, his reporting on police brutality and the criminal justice system led to 70 fugitives surrendering themselves to him instead of police. When he came to UNC to teach, he recruited and mentored top journalism students, with a soft spot for those who worked at the DTH. “College is just an excuse to work for The Daily Tar Heel,” he famously said. And we never forgot it. 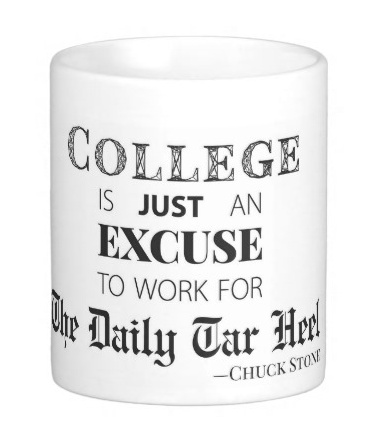 The DTH T-shirts and coffee mugs now available for alumni to purchase pay tribute to Chuck Stone and his support of the DTH. Design by Tyler Vahan. The gear is currently for sale through the Alumni Homecoming registration page. You do NOT have to come to the alumni event to order a mug or shirt (or donate to the DTH) through the registration page. It’s easy! Shirts are $16. Mugs $7.50. Embroidered fleece $37.